Callaway is a trusted name in the golf equipment manufacturing industry, and the company does not disappoint with the Dawn Patrol golf glove. It is a sharp looking glove with an all leather construction for maximum durability and great feel. The Dawn Patrol also features a perforated design on the palm, fingers, and thumbs to enhance breathability, a Cotton Terry Cuff and an Opti-Fit Closure for a custom and secure fit. Material: It is an all leather material which makes it very durable and gives it a great feel. Also, the fact that Callaway is a reputable company means that you can trust that the material is genuine even before you get to wear it. Size: Most golfers that use this glove seem to be happy with the fit, and most will agree that the size is just right. The Dawn Patrol is available in all main sizes including Small and Extra large to ensure that every golfer can find something with a perfect fit. 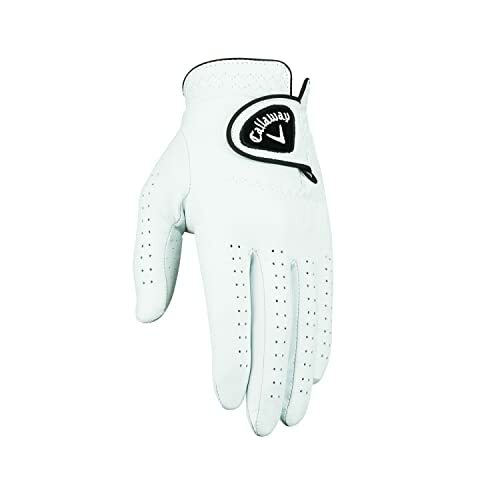 Perforated Design: This Callaway glove comes with some perforation on the thumb, finger, and palm which are one of its outstanding features because it helps in the reduction of moisture and increasing breathability of the hand when wearing it. Cotton Terry Cuff: The cotton on the cuff in this golf glove gives it a soft feel and helps with the absorption of moisture to keep your hands dry. Opti-Fit Closure: The Opti-Fit Closure is adjustable, and it is what makes it possible to get a custom fit when wearing the glove. Also, it is light, thin and very secure to ensure that it does not move during a swing. The all leather construction gives it an incredible feel and also makes it very durable. It has some perforations that make it a very breathable golf glove. This golf glove has a cotton cuff that gives it a soft feel and increases the moisture absorption. It is an affordable glove despite its high-quality construction and durable materials. The glove guarantees an excellent grip, and it will not slip during the swing. Just like most other gloves from Callaway, it is comfortable even when you wear it for several rounds continuously. The smooth and shiny finish and the clean white shade give it a very attractive overall look. It comes in all the main sizes including Small and Extra Large. Although it is leather, it is still not as durable as most golfers would want. It loses some grip after a few months of continuous use. The stitching is still not the best as it will start going apart after some time. Some golfers find it too short on the wrist. A best golf glove makes it possible to maintain an excellent grip on your clubs at all times. Callaway makes some of the best in the market, and the Dawn Patrol is one of their leading types. It is a beautiful glove, and this is regardless of the fact that it comes in a simple white shade. But, there is still more good elements to it than the appearance because the manufacturer uses modern technologies to ensure that golfers always get a comfortable and perfect fit and that it does not slip. Also, its breathability and moisture absorption capabilities will impress most golfers. The price is also perfect, and although it has a few demerits, every golfer will enjoy the service that they get from it and so it is an excellent choice for both amateurs and professionals.